LGM Advisors is a trusted Melbourne law firm, providing expert employment Law services. LGM Advisors have the skills, experience and expertise to ensure that you and your employment law matter is consulted upon with the utmost professionalism. Contact LGM Advisors and speak to an employment lawyer today on (03) 9832 0608 or by email at marketing@lgmadvisors.com.au. Employment law protects the rights of both the employer and the employer. The experience of a good employment lawyer is important in evaluating and negotiating the terms of any new employment contract or agreement. Understanding the terms and legality of the contract, as well as your legal rights prior to signing is important before you accept any job. Employment in Melbourne is protected in a variety of ways ensuring that employers are providing adequate internal resolution of employee concerns, lawful and fair employment expectations, and lawful dismissal while following requirements of compensation. Employment law is taken seriously in Melbourne and choosing the right lawyers to review your concerns, claims, and ensure the law is working on your behalf is important before, during, and after employment. LGM Advisors is one of Melbourne’s most sought after employment lawyers in Melbourne. Below are how our expertise may assist you. Employment contracts can be complicated, and at times difficult to define once a claim has been filed due to the nature of the agreements themselves. Employment contracts can be either in writing or oral, as well as oral and partially written. They are not necessarily limited to a single document, yet are often found in multiple documents such as the initial work agreement, policies, job descriptions, work processes, and additional training. The law not only protects big-company based employment, but also freelance, and independent contractor employment agreements.By utilising an employment lawyer Melbourne professional, like LGM Advisors, you will have access to the expertise and legal experience in employment law. 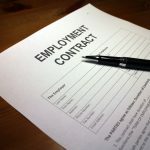 Prior to starting a job, it is important that you understand the terms of your employment agreement, as well as the consequences for breaching that agreement, a statement often ending…up to and including termination. While used often in policies it should not be held lightly. A breach of employment contract occurs when one party does not act in accordance with the employment agreement. The law is situated to protect the employee from unlawful acts which lead to personal damage, such as termination due to harassment, various discrimination, or other agreements stipulated in the contract. However, the law also protects nontraditional workers from employers who demand work outside of the agreement and workers who do not fulfill their work in accordance with the agreement. Documenting why you feel a contract has been breached, the discussions, and any evidence you may have will help a lawyer better evaluate your situation and recommend a path forward. Many employers are unaware, or uncertain, of their lawful requirements. Utilizing a qualified legal team can help you benefit from Alternative Dispute Resolution in many cases, preventing the need to go into litigation. While it is important to do your diligence in understanding the full scope of your employment contract, one of the more vital components of the contract is the non-compete agreement. This is important due to the implications concerning other employment after working with your current employer. The non-compete agreement is a post-employment agreement usually stating you will not work for, or set-up, a competing business within a geographic region and for a stipulated period of time. Often a company will require potential employees to sign this agreement due to concern over intellectual property rights. However, if you leave this employer you may find yourself in a bind as your expertise and skills may be entirely lent to your previous employer’s industry. If you feel the non-compete agreement within your contract is unreasonable, you should consider negotiating the agreement prior to signing your employment contract. While you may not be able to remove all aspects of the non-compete, negotiating a reasonable compromise is possible. Contacting an employment lawyer Melbourne expert, like LGM Advisors, will make the process easier as well as the reassurance that you are getting professional advice. Also known in employment lawyer Melbourne terms, workplace harassment, workplace bullying is more common than you may think often leading to stress in the workplace, and sometimes more harmful consequences. Bullying is when a coworker, whether colleague or leader treats an employee in such a way that it is considered unreasonable, leading to a risk in health and safety. If you feel you may be subject to workplace bullying a legal consult can help you establish your claim and determine if your employment is covered by the Federal Anti-Bullying Law, is unreasonable, creating a risk to your mental or physical being, and is likely to continue without intervention. Australian law prohibits workplace discrimination based on specific attributes, such as gender, race, age, political or religious beliefs, and disabilities. Discrimination can come as a result of demotion, unwarranted poor reviews, termination, or standing in the way of potential opportunities. Workplace discrimination can occur to anyone in the workplace regardless of position, rank, or duty. The laws in place look to ensure every employee has the same rights and protections while at work. Sexual harassment is any conduct viewed as an unwelcome sexual conduct or advance. It is not subject to gender or position. Sexual harassment is often treated severely by companies as if a company cannot prove they took reasonable steps to prevent the conduct, the company is also held liable. In addition to sexual harassment, victims and witnesses to sexual harassment are protected by coming forward to report such misconduct at work. Much like whistle-blower protection, all employees have the right and are protected by coming forward against a company or individual. Any threat perceived as detrimental to the employee or the employees job would be considered for victimisation. Dismissal and redundancy laws protect employees who have been forced to retire or vacate their position, unlawfully terminated, or terminated due to a position no longer being available. The laws on dismissal and redundancy are clear, and if you feel as if you have been wrongfully dismissed, or your dismissal benefits were not satisfactory, it is imperative you act quickly. There is only 21 days from dismissal for you to file a wrongful dismissal claim. Your termination was not justified due to your position and conduct in leading up to the termination. You were not notified of the reason for termination? You were not given sufficient opportunity to respond to the accused reason for termination. While the laws very slightly depending on the size of your company, they are in place to protect the employee, and quick action as well as evidence you provide will be essential to your claim. While unlawful dismissal is the “how” of your termination, wrongful dismissal is more of the “why” of your termination. Wrongful dismissal is the breach of an employment contract by the employer, leading to your dismissal. Unlawful dismissal is typically resolved in one of two ways, and is best done so with the help of an employment lawyer Melbourne professional. You can either be compensated by your previous employer for damages sustained as per your termination. Or, you can continue within the scope of your current contract. In this case you still have the opportunity to receive compensation for damages including time-lost wages. Compensation is generally the result of wrongful dismissal, however there are unique circumstances, often in regards to contract work where returning to work under the scope of the contract results. Unlawful termination is when an employer terminates an employee in such a way that the employer has broken a law. Unlawful termination can be a result of discrimination, protected absences, non-membership of a trade union, or filing a complaint for breaking the law. Unlawful termination protects an employee from unlawful acts by a company and is protected under the Fair Work Act 2009 (Cth). In all claims you will need to prove that were terminated due to the criteria of unlawful termination and not as a result of your work performance or behavior. Dismissal by redundancy is a complex situation. There are two factors you are evaluating. The first is whether your position was actually made redundant, or if you were simply dismissed under that pretense. The second is if your position was made redundant, were you adequately compensated for your dismissal, as in receiving your entitlements and full redundancy pay. Companies often do not fully understand the law and obligations they have when making a position redundant. Like all unfair dismissal claims you must act quickly and discuss your situation and options with a lawyer. Employment law is not always understood by the employee or the employer. As is the case it is important that you review your contract or agreement prior to committing to a new job, as well as understand the expectations of your work, and consequences for not upholding the employer’s policies and requirements, as well as the laws protecting you. An employment lawyer Melbourne can help you determine if you have a claim to file against an employer based on your evidence, as well as help you file that claim within the mandatory 21-day limit from time of dismissal. A lawyer can also suggest a strategy going forward and represent you in litigation if your claim cannot be resolved in alternative dispute resolution. Contact the employment lawyer Melbourne experts, LGM Advisors today on (03) 9832 0608 or by email at marketing@lgmadvisors.com.au.